Pixar’s Coco will attempt to chart the world of the dead. 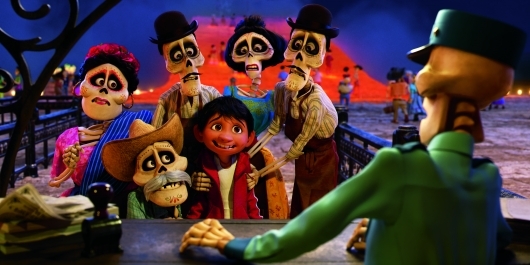 Directed by Lee Unkrich (Toy Story 3) and Adrian Molina, the movie centers on Miguel (Anthony Gonzalez), who is magically transported to the world of the undead, and joins trickster Hector (voice of Gael García Bernal) on an extraordinary journey to unlock the real story behind Miguel’s family history. We’ve already seen two trailers, and now the studio has previewed some brand new footage just in time for this year’s D23 Expo. So if you are already pleased by what you have seen so far, get ready to get even more excited by the footage description. Check it all out below. Two of the main themes of the film are family bonds and learning from the past. But Miguel’s family has banned music altogether because of Ernesto de la Cruz (Benjamin Bratt), Miguel’s great-grandfather, who abandoned his great-grandmother. So in hopes of winning a talent contest, Miguel desperately looks for anyone who would let him borrow a guitar. When no one has any to offer, he goes to the gravesite of Ernesto de la Cruz, where his silver guitar rests on the headstone. He asks him for forgiveness, for what he is about to do, and follows through with Cruz’s epitaph “Seize The Moment.” Soon the marigold petals that rest on the floor start to glow. And once Miguel plays the guitar, it releases a powerful magic that lets him live amongst the dead. Startled, Miguel reacts as anyone would when you realize that you can see the dead and the living can’t see you. He then falls into an empty grave where he is helped by a mysterious woman. Her face is darkened from Miguel’s point of view but once she comes into the light, he soon realizes that not only is she dead, but he can see and touch her. In another clip, we see Miguel’s deceased family members take him to the Department of Family Reunions. Think of it as a spiritual connection to the living. Leaving flowers or photos on a grave will allow you to be reunited with your family. However, because Miguel has taken a photo, Miguel’s great-grandmother was unable to be reunited. He also realizes that playing the guitar put a curse on him, and if it isn’t lifted in time he will start to live amongst the dead as a skeleton. The film will feature new songs from co-director Adrain Molina and Germaine Franco. Pixar’s music good luck charm Michael Giacchino will compose an all-new score. Frozen songwriters Kristen Anderson-Lopez and Robert Lopez (who penned “Let It Go”) provided one of the film’s newest songs “Remember Me,” which is sung by Benjamin Bratt as Ernesto de la Cruz. Also part of the team is musical consultant Camilo Lara of the music project Mexican Institute of Sound.